A marrow is a cucurbit, which means it is from the same family as a squash and courgette. The marrow is actually a courgette that has been left on the plant to grow for longer. 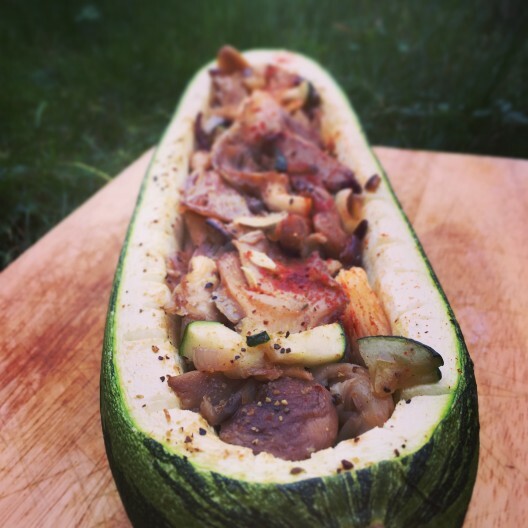 Marrow has creamy flesh, edible skin and seeds that are a very mild flavour. 200g of mixed mushrooms e.g. Shiitake, Buna-Shimeji, Shiro-Shimeji, Eryngii, Oyster mushrooms, Enoki, Golden Enoki, Maitake. Now put the marrow in the smoker for about 30 mins at around 250F. This will bring the moisture out and also add a smokey flavour to the flesh of the marrow. While the marrow is in the BBQ roughly chop the other ingredients and fry them in a pan for until the moisture is fried off and the veg are soft. Take the marrow off the smoker and stuff it with all the veg you have fried off. Return the marrow to the smoker for another 30 mins.